This new image of Mars taken by NASA's Mars Reconnaissance Orbiter shows an optical illusion. 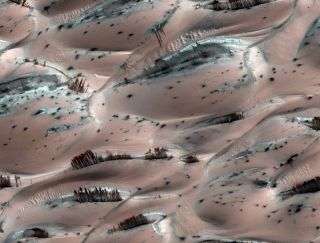 What appears to be trees rising from the Martian surface are actually dark streaks of collapsed material running down sand dunes due to carbon dioxide frost evaporation. The image was released in Jan. 2010. Naturallyerupting dust clouds on Mars are creating structures that look surprisinglylike trees near the planet's north pole. But don't be fooled ? it's just anoptical illusion, NASA scientists say. The Martian"trees" are actually dark basaltic sand pushed to the surface of sand dunes by sun-heated solid carbon dioxide ice, or dry ice,sublimating directly into vapor, explained Candy Hansen, a member of NASA'sMars Reconnaissance Orbiter (MRO) team at the University of Arizona. The sanddunes form a nearly complete ring around Mars' north pole and are covered by athin layer of reddish Martian dust and patches of dry ice. To date, there is nofirm evidence of any type of Martian biology, past or present, plant orotherwise. In the Martian spring, the sun warms the ice, causing it to sublimate directly into vapor, andthe resulting gas dislodges surrounding dust and sand particles. "Whatwe think is happening is that the dark sand is sliding down the bright frostedportion of the dune," Hansen told SPACE.com. The image,taken by MRO's High Resolution Imaging Science Experiment (HiRISE) camera, ispart of a series of Martian images appearing in a special issue of the journalIcarus this month. The Martianillusion is not the first to capture the imaginations of people on Earth. In 1976, a photograph of a rock formation on Mars beamed to Earth by NASA?sViking 1 orbiter looked to many like a face carved in the Martian surface. The Face onMars photo?s legacy has survived to this day, even after additionalobservations by more advanced spacecraft have revealed it to be a trick oflight and shadows. Since then, other Martian illusions have popped up in images from orbiters and rovers, including an object that resembled a small bunny and a rock that looked like a female figure to some and Bigfoot to others. The streaks in the new imagelook as if they are rising up from the sand dunes, but that's an illusion,Hansen said. "You're looking at the slip face of the dune, and where thesand comes to a stop, it forms a sort of scallop-shaped edge at thebottom." Each darksand streak can measure up to 164 feet (50 meters) in length. HiRISEactually caught one of the dust eruptions as they happened. "Ifyou look closely, you can see this little dust cloud casting a tinyshadow," Hansen said.